A selection of pictures of the Sarawak Cultural Centre, a living museum located at Santubong. The Sarawak Cultural Village conserves and portrays the multi-faceted cultures and customs of ethnic groups such as the Ibans, Bidayuhs, and Melanaus. The Cultural Village is 35 km from Kuching town and is definitely a must-see attraction. Near the Cultural village there is the Damai beach. The Cultural Village is quaintly landscaped with a manmade lake at the centre surrounded by 7 authentic replicas of ethnic houses: the Bidayuh centre house and longhouse, the Iban longhouse, the Penan hut, the Orang Ulu longhouse, the Melanau Rumah Tinggi, the Malay house and the Chinese farmhouse. Displayed in each house are many artefacts made by individual dwellers. Demonstration of arts and crafts like beadworks, wood and bamboo carvings, pua weaving and straw weaving can be seen while touring Village. The rich cultural heritage in the form of dances and music presented by various ethnic groups is one of the highlights of the visit. 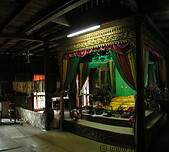 The grand cultural show which lasts about one hour is performed in the Village theatrette.